As many of you know by now, I have a special interest in children’s literature. As an artist and writer, the story of how a picture book comes alive with the addition of complementary illustration never ceases to fascinate. After all, a picture is worth a thousand words! Today Sarah Ackerley joins us to share how the newest book from Little Pickle Press came to her drawing board, and how she developed a seemingly dry subject matter – how your brain works – into a fantastically humorous and delightful book for children ages 4 and up. Dani: Sarah, first tell us a little about how you prepared for a career in picture book illustration. 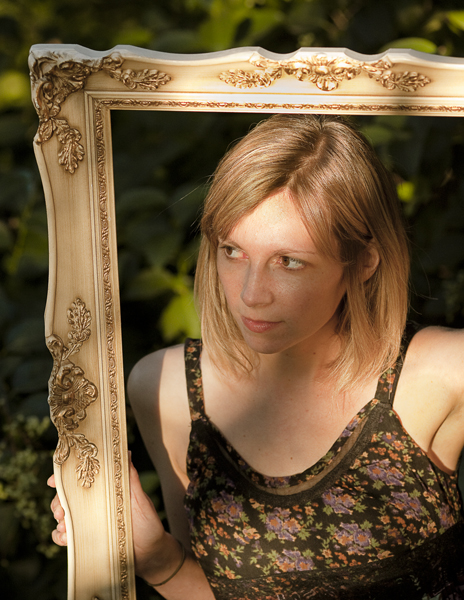 Sarah: I studied fine art at the University of Texas at Austin where I focused mainly on drawing and painting. UT doesn’t have an illustration department, but I always had it in my mind that I would like to some day pursue picture book illustration. 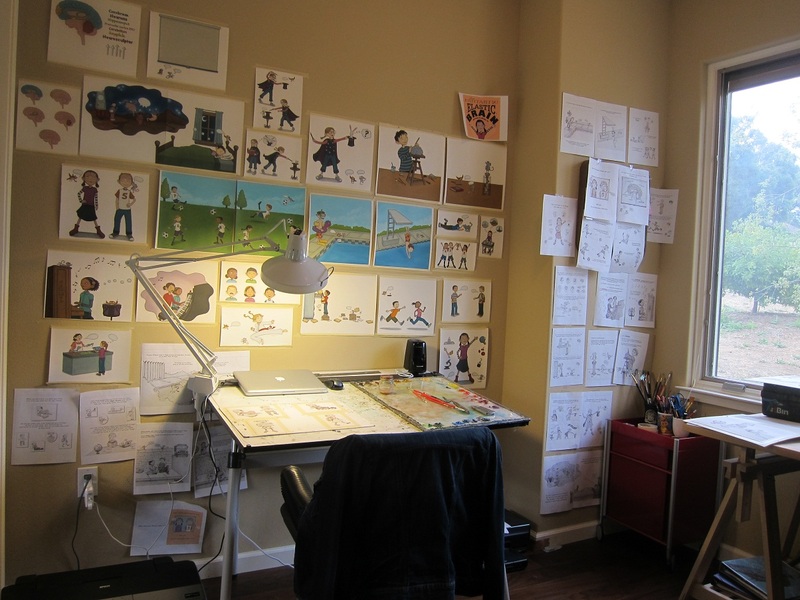 After graduation I began to build an illustration portfolio, attend SCBWI meetings, and read everything I could about the world of picture books. It took several years before I made any kind of breakthrough, but it was the most rewarding day when my first book was published in 2008. I have been working as an illustrator ever since, and I really love what I do. Dani: Where did the idea for the necktie-wearing bird and mouse duo come from? Sarah: When I got the manuscript for Your Fantastic Elastic Brain, I immediately thought of author/illustrator Laurie Keller and her goofy take on the somewhat dry subject of dentistry in Open Wide, Tooth School Inside. She livened things up with a bunch of silly, joke-cracking teeth, which I loved. 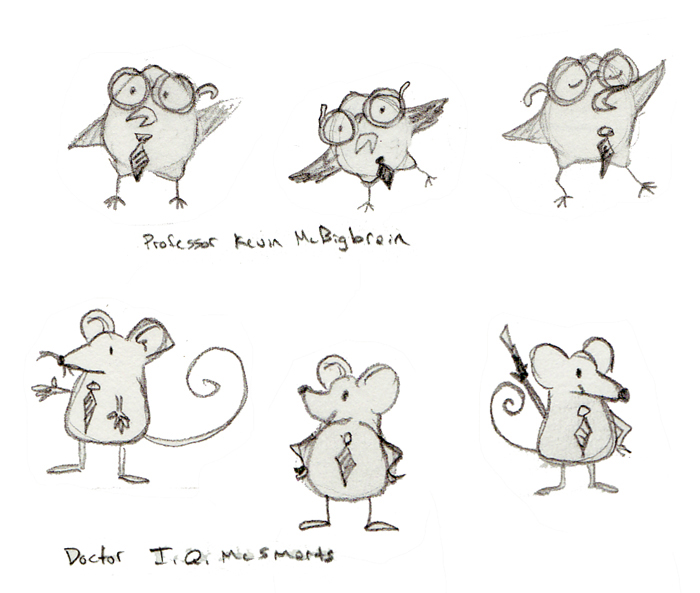 So I decided to give Your Fantastic Elastic Brain its own goofballs, and thus a necktie-wearing owl and mouse duo was born. Dani: How did you approach this scientific topic and what was your inspiration for your approach? Sarah: Art director Leslie Iorillo really opened my eyes to the best way to approach this scientific book. She told me to make the kids in the illustrations the main focus. For example, on the pages where the parts of the brain and their functions are explained, the brain illustration is relatively small and the children take the spotlight. I think that was the best piece of advice I got, and I really tried to make the illustrations in the book something our kid readers could relate to and identify with while they absorbed the scientific content. Dani: What is your illustration process? Sarah: I do my initial drawings in pencil, scan them into Photoshop and edit as needed, then print them out. I then trace the original drawings with a brown Prismacolor pencil to create a more refined, final drawing. Next I take the final drawing, scan it again, edit again, then print that drawing directly onto Arches 140 lb. watercolor paper. (I have an Epson printer that can handle up to 140 lb. paper). I paint over the drawing with clear acrylic gesso to prime the surface, then paint the final illustration in oil paints. Since oils are semi transparent, the original drawing shows through the paint. 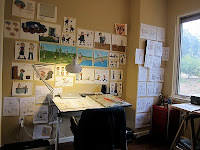 Dani: What was the most fun part of illustrating this book? The most challenging? Sarah: The most fun part of creating any book for me is doing the thumbnails and fleshing out the book in the very beginning. It’s so exciting to watch things take shape, and this stage is very creative and energizing. I spend a lot of time looking at other picture books during this phase, and I am constantly jotting down ideas so I don’t lose them. The most challenging part of creating this particular book was that I only had 3.5 months to do it. I essentially had words on a page in late June and had to conceptualize and create an entire book from those words by mid-October. I work 3 days a week as a nanny, too, so there was that additional time constraint. It was the biggest challenge I’ve ever taken on in my life… I think my own fantastic, elastic brain was stretched to the max during the process! Dani: Mine is stretching, too, Sarah. At my age, that’s a really good thing! Thanks for sharing your process and thoughts with us today. Readers, if you have questions for Sarah please leave them in the comments. Also, be sure to leave a comment to get into the book drawing – you must leave us an email so we can contact you! 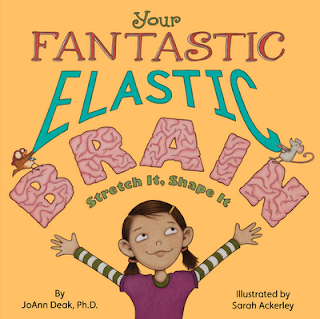 You could win a copy of Your Fantastic Elastic Brain written by noted preventive psychologist, JoAnn Deak Ph.D. and illustrated by Sarah Ackerley... but only if you leave us contact information. 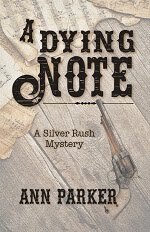 If you want to order the book now, and get 25% off as well, click here and use coupon code BBTPENCIL at check-out. Then go over to the Little Pickle Press blog by clicking here, where they have a Grand Prize drawing for FIVE books in a special eco-friendly recycled plastic bag! 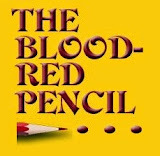 Tomorrow for stop #6 of this blog book tour, we visit fellow Red Pencil, Helen Ginger, at Straight From Hel, with a publishing story that’s, well... straight from hell. 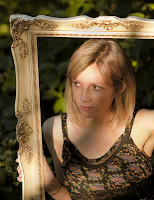 Dani Greer is founding member of the Blood-Red Pencil blog, an artist, writer, editor, environmentalist, and sometime Special Projects Coordinator for Little Pickle Press. 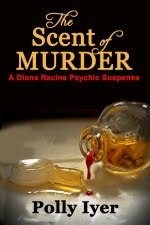 She also teaches blog book tours classes which prepare authors to plan tour stops like this one. The next class begins 2/1/2011 and you can sign up here. I'm so envious of your talent. Alas, I can't even draw a straight line. Most artists don't try to draw straight lines, Morgan. It's the curves we like! Sarah will drop by later if anyone has questions. Sarah sprinkled the whimsy and infused the fun throughout this informative picture book for children. Thanks to Sarah, my pickles giggle as they learn about the amazing capacity of their brains. Those are cute drawings of the mouse and owl. This is the type of book young children will love and learn from. Sarah is a special talent. She is insightful, bright, creative, AND has a fantastic sense of humor. We were over the moon when we saw her first sketches, and got higher and higher as the process evolved. As an art director, I couldn't be luckier to have worked with such an amazing artist. I look forward to watching her career as IT stretches and grows! Very interesting. I had no idea how the process worked (and "work" is definitely what this is). Thanks for sharing! The illustrations look really great! We'd love to give this one a try! Awesome job Sarah! I've been excited to hear all about your process and experience since your comment on the blog tour here for What Does it Mean to Be Present. It's always so exciting to hear what other illustrators have to say! I hope your brain is rested and revitalized after the exhausting process. Your illustrations are SO FUN!! 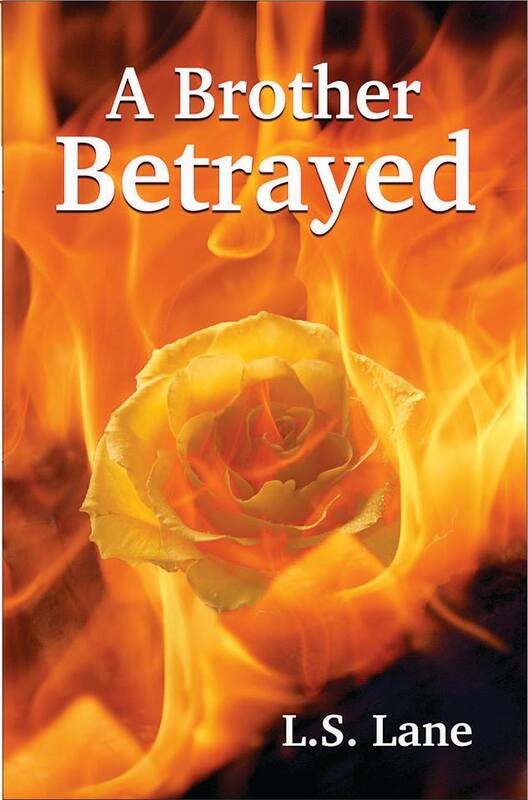 I can't wait to pick up the book. So cool! Thanks for that interview. It is so neat to hear about the process. 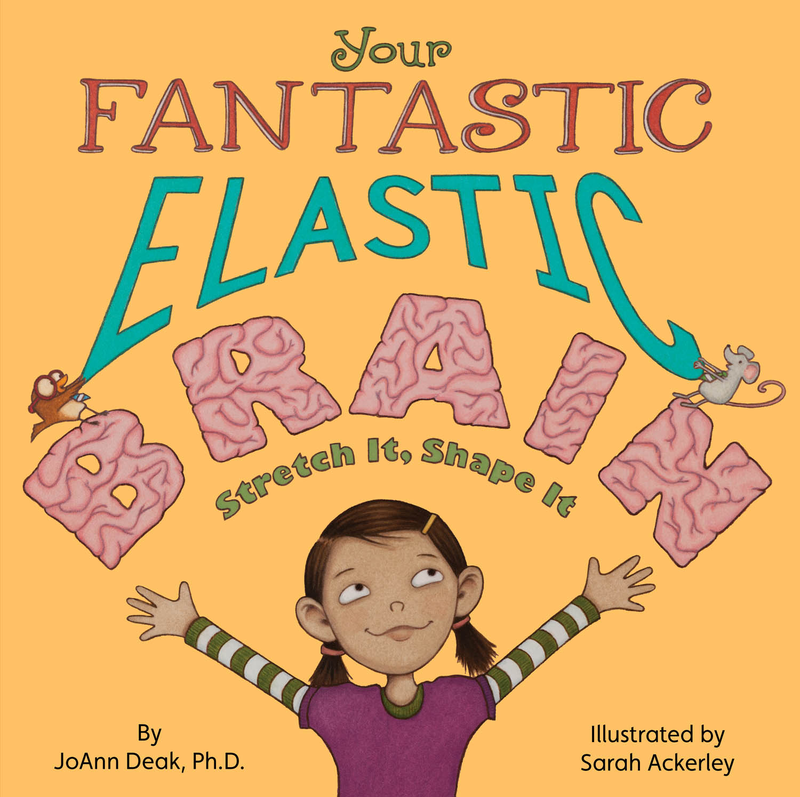 I enjoyed learning about Sarah's process for creating her wonderfully colorful illustrations for Your Fantastic Elastic Brain, as well as the inspiration for her comical owl and mouse. 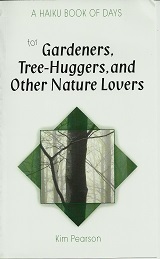 This book illustrates the perfect union of text and art. I look forward to reading it. s-t-r-e-t-c-h their fantastic brains. How cool is that? I'm happy to answer any question you might have about my illustrations. Thanks for stopping by! Very interesting to hear about your process using Arches 140# and clear acrylic gesso for the oils. The books are beautiful! I really enjoy getting to know more about how some artists work. I need to learn more about the process Sarah described of sketching, scanning, and then the final painting. When I have painted, I just sketched on the canvas and then painted. And I really love the sense of fun and whimsy she brought to the book. Terrific way to engage children. Interesting! If I were still a school librarian, I'd definitely be buying this book. It's so valuable to find ways to appeal to young children and make learning fun. I'm sure they'll enjoy this one so much, especially because of the cute illustrations, that they'll hardly realize they're learning stuff. Thanks for this interesting interview, Dani. Interesting to hear from the illustrators point of view. It looks and sounds really awesome. Sarah, how long do your oil-painted illustrations take to dry? Do you have to stretch your paper, or do oils not tend to warp the paper like watercolour does? Oh, and is there a particular reason for using brown instead of black for tracing? Those are all great questions! So the oils take about a day or two to dry. I paint in very thin layers, so I don't have the week long dry time that other oil painters have. And I do tape the watercolor paper down securely to a piece of masonite with some drafting tape to keep the paper from buckling. It stays flat even after I remove the tape. As for the brown pencil, I just like the color better than traditional black. It's a little softer, and the outline isn't as noticeable. Thanks to everyone for a fun and lively discussion. Now go check out the book!